Assistant Minister for Health & Medical Services Alex O'Connor on April 12, 2018. National Adviser for NCD & Wellness Dr Isimeli Tukana said people should be taught to eat when they are hungry not when food is available. Speaking at the media and diabe­tes advocacy workshop on Thurs­day at the Holiday Inn Suva, Dr Tukana said this did not mean that people should be stopped from eat­ing. Rather, he said, people should make informed choices on what to eat and for healthier food choices. “It is not that Fiji lacks food. We have so much food, but we have for­gotten what to eat, how to eat and when to start and when to stop,” Dr Tukana said. Chair for Diabetes Fiji West Dr Jone Hawea said in the Fiji context diabetes was an ongoing disaster and was preventable. 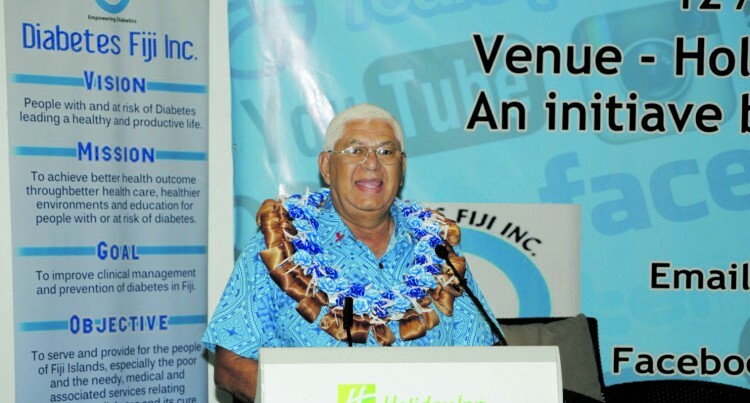 He said: “People like us at the Min­istry of Health and Diabetes Fiji have been isolating ourselves in the fight against diabetes. The key to advocacy is getting the media in for the media to be educated and that diabetes is the crisis”. Assistant Minister of Health & Medical Services Alex O’Connor said: “The three main causes of mortality and disability in Fiji are heart diseases, diabetes and stroke. These are Non Communica­ble Diseases that can be prevented through modifying our lifestyle through healthy diet, being active, quit smoking and having enough sleep”.